Please tell us what you think about our farm on the form below, our animals, the premises, us, whatever you'd like. Would you recommend us to others? Your feedback is highly appreciated. Please leave your testimonial about the experience of your visit, your animal, etc. To our customers, thank you for choosing us and to our visitors, we were happy to have you! In April 2014, my husband and I drove 4 hours to see and purchase our 2 Myotonic goats, (Brooklyn and Mackenzie). Upon arriving, Karrie met us by the barns where they keep the goats. She had separated our goats out that morning and made sure that they were all groomed and ready to go. She explained that they had all their shots, and also explained registering them into our names. It was a very nice experience. The goats are very healthy, beautiful, and made such a nice addition to our family. If you are looking for Myotonic goats for your family or farm, I highly recommend Fleetwood Farm as the place to look. If you should ever have any questions, Karrie is always willing to answer them and very prompt at getting back with you. Thank you Fleetwood Farm for our wonderful girls. What a wonderful place! We had the privilege of touring Fleetwood Farm and seeing the animals. My wife and I and our kids got to see and interact with the goats and pigs. Such a delightful experience, the animals are amazing and Karrie is such an excellent caregiver. Truly amazing! Fleetwood Farm is Unbelievable! So clean and an amazing family that takes such wonderful care of their animals! I am not sure what is my favorite....I think the micro pigs! I'm not really sure that they know they are a "pig"and not a puppy! Lol....they are so smart and so fun to watch! Fleetwood Farm is an amazing place! A friend and I went on a road trip and Fleetwood Farm was one of the stops since my friend loved the micro mini pigs and had a strong interest in purchasing one in the near future. Karrie was so helpful and welcoming when showing us around the farm and expressing great knowledge about raising animals. You can tell she and her family really have a passion for what they do at the farm. 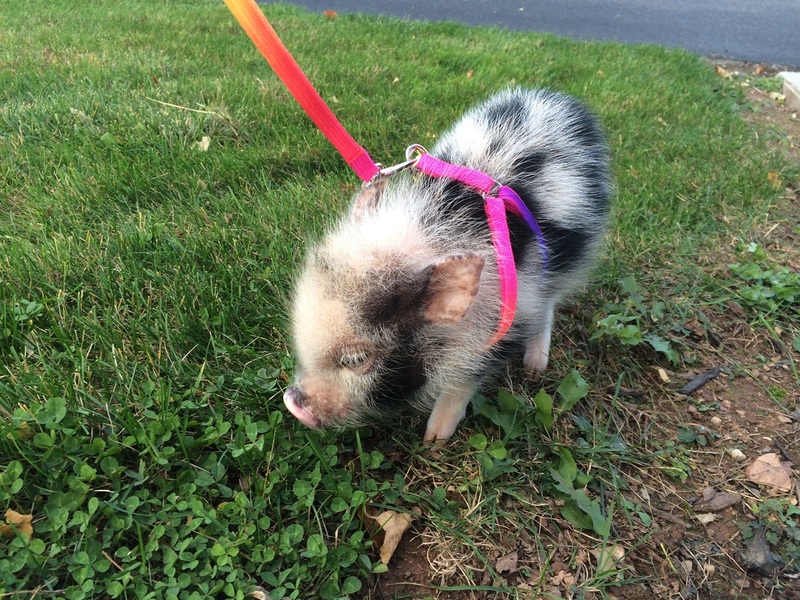 When my friend decides she is ready for a micro mini pig she will look no other place than Fleetwood Farm. 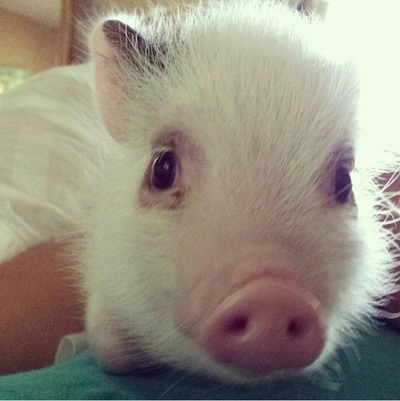 My daughter has been wanting a pig for a very long time and we searched a bunch of websites on where to buy them and what to expect. We found Fleetwood Farm which had the most information about them. When I called and talked to Karrie about them, she was very nice and answered all my questions that I had. 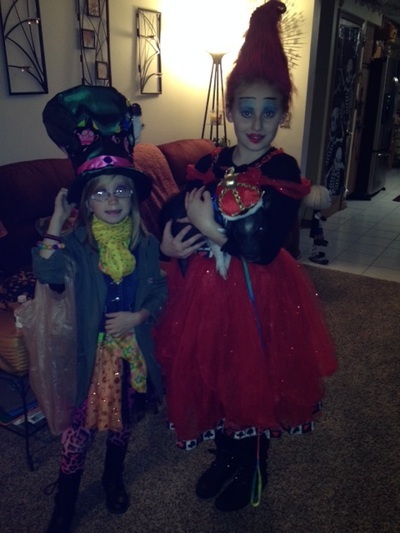 We decided to get, but had to wait a while until they were born (it was so worth it). While we were waiting, Karrie let us come to see the parents anytime we wanted and each time we went she was very pleasant and answered any questions we had. Her home was very very clean. You would not expect any animals living there. The barn where the pigs stayed was also very clean and neat and didn't smell at all. 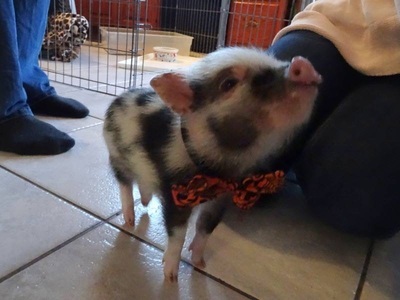 I would highly recommend if you are thinking about getting a pig to call them. We just brought ours home and he is doing good thanks to Karrie helping them to get use to human contact. She is a wonderful person and knows a lot about the piglets. Fleetwood Farm is absolutely amazing. I was extremely impressed with the great care they take in their animals. 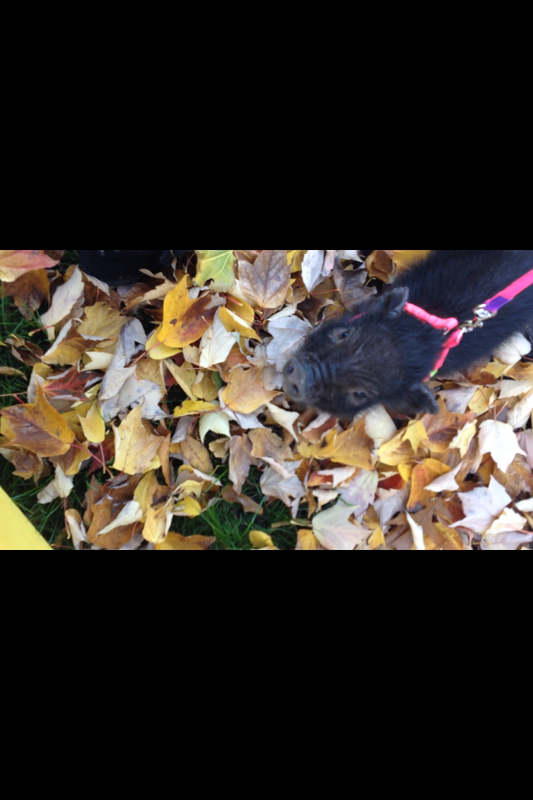 I would highly recommend Fleetwood Farm to anyone interested in a micro mini pig. You will not find anyone better than the Fleetwood family when it comes to knowledge and care for their micro minis. The farm itself is beautiful and all the animals there are treated with the utmost care. 5+++++ stars in my book. Being in the animal behavior, training and enrichment field on a professional level, I have had the honor of being introduced to Karrie Fleetwood and getting to know her over the past couple of years. I have been out to visit the farm on several occasions and have been impressed with each visit. The care and education on all of the animals shows. I have since consulted with Karrie on numerous occasions, especially pigs and micro-mini pigs, behavior, health, and nutrition. 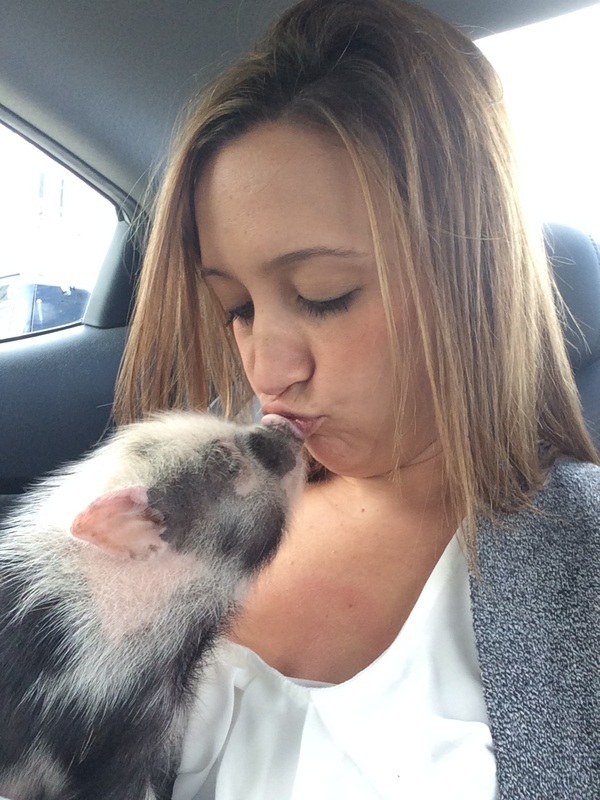 Karrie is a definite asset to the animal community. 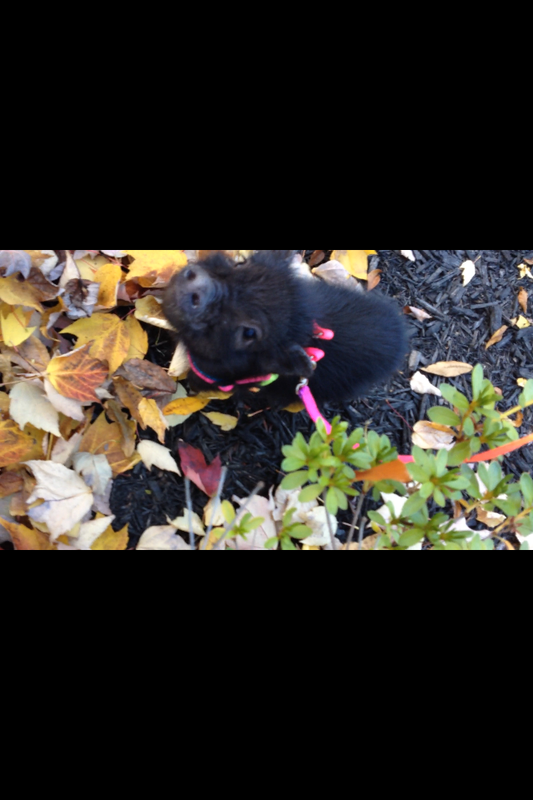 If you are researching micro mini pigs, look no further, Karrie and her family are wonderful representatives of pig ownership and breeders. 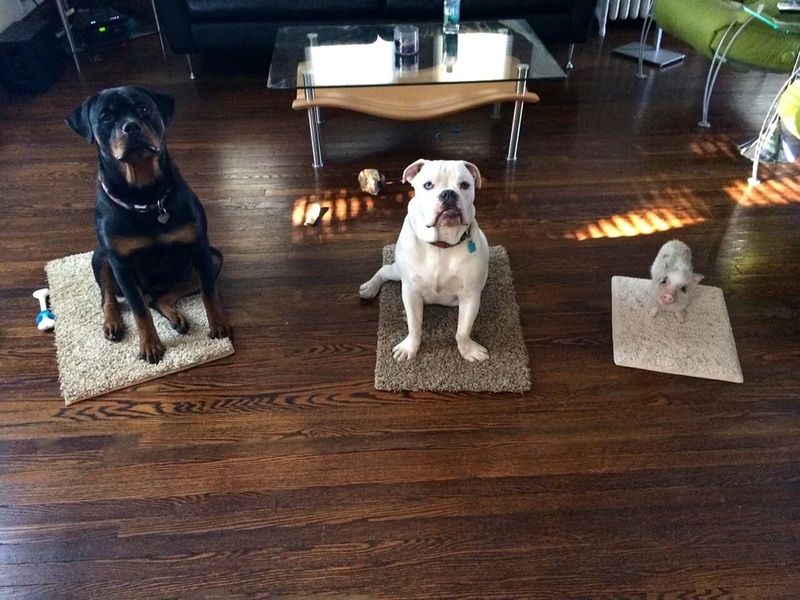 Their babies are not only physically healthy, but emotionally adjusted when you bring them home. Our Oscar is such a good boy, loves to cuddle, and is wonderful with our children and dogs. Karrie is always ready to talk or have you visit. 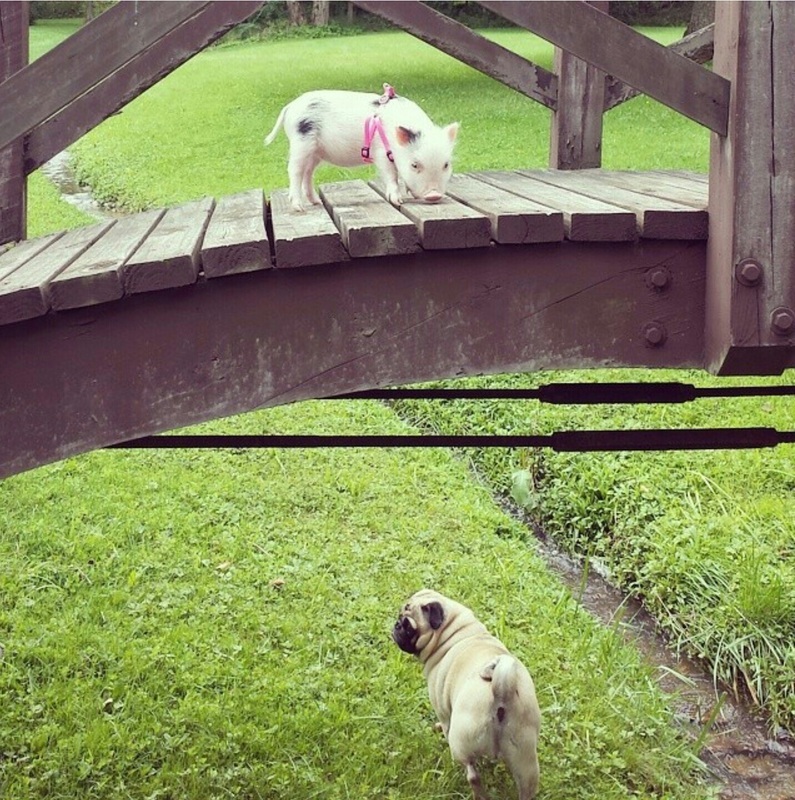 Her pigs are just wonderful. When our family decided to adopt a micro pig, Fleetwood Farm was the best decision we have ever made. We had our little Sunny shipped from Ohio to Arizona. Karrie went above and beyond what was ever expected of her. Karrie drove all the way to Detroit so that our Sunny could have a non stop flight. Our adoption happened really fast, but that didn't stop Karrie and her family from crate training Sunny for the trip and teaching him his name, which he knew when we got him. 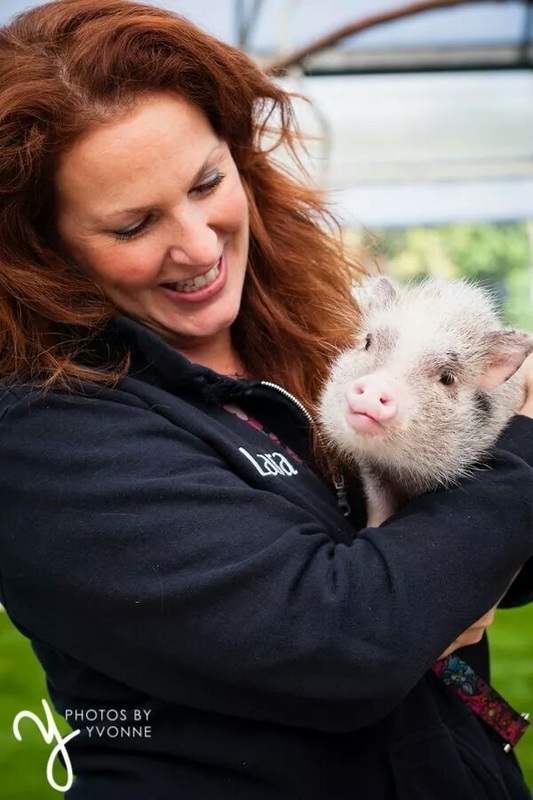 We have had a million questions for her and she takes the time to answer every one of them, no matter how small.Her passion for the care, knowledge and well being of her animals surpasses being a breeder. We have comfort knowing that Karrie will always have time for questions, comments or just to share. We can't thank them enough for making our adoption possible. If you are looking for a breeder, look no further. I can not speak highly enough of Fleetwood Farm. As an academic, I have a tendency to do far too much research with anything that interests me (and to be a bit longwinded so forgive me). In this case, it worked in my benefit. 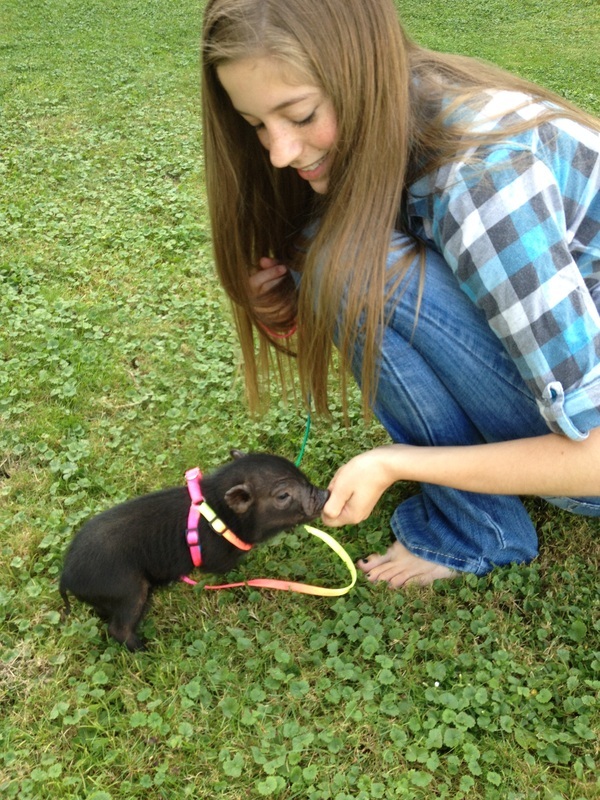 I first spoke with Karrie about a year and a half ago through an email inquiring about her pigs. Karrie was more than happy to answer every question (and I assure you, there were many) I had about Juliana pigs; how they act as pets, what their actual size will be, what the care is like, what they eat, how much activity they need, etc. Some of the questions, I admit, were ones I already had answers for and served only to test her legitimacy. I am happy to say that she knew the answer to everything I could dream to ask and more. After contacting her for quite some time, I decided to place a deposit on a Juliana pig. 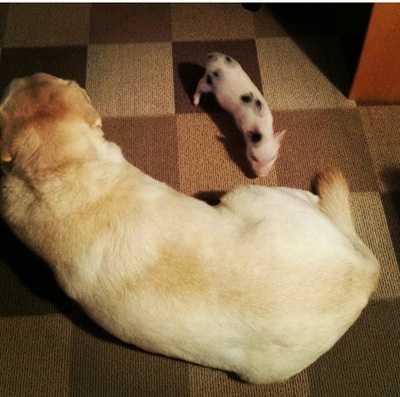 During the year that I had the deposit down (a year due to my being away at graduate school and Karrie patiently waiting for the pig that fit my specifications), I would receive constant updates from Karrie regarding her breeding pigs, their litters, and answering any questions that came up. When a piglet was born that fit my specifications and I was ready to own my very own piggy, Karrie generously allowed me to visit her home. 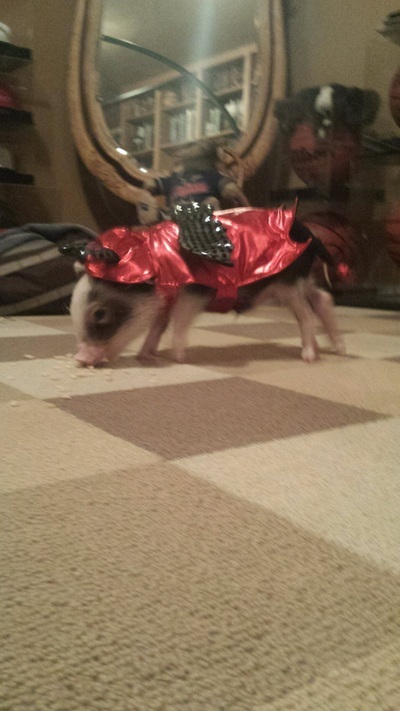 Even at that time, I had only lain down my deposit and was not 100% sold on the idea of a pig. In person, she was even more sweet and kindhearted than she came across through email. 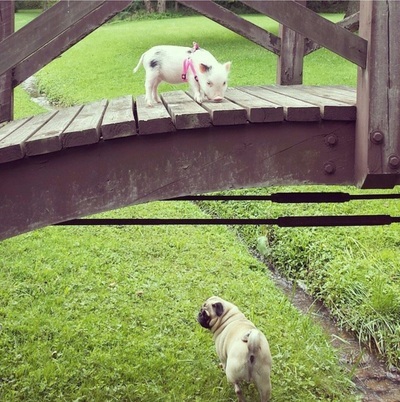 The professionalism and expertise she exhibited was only surpassed by her evident love of the pigs. 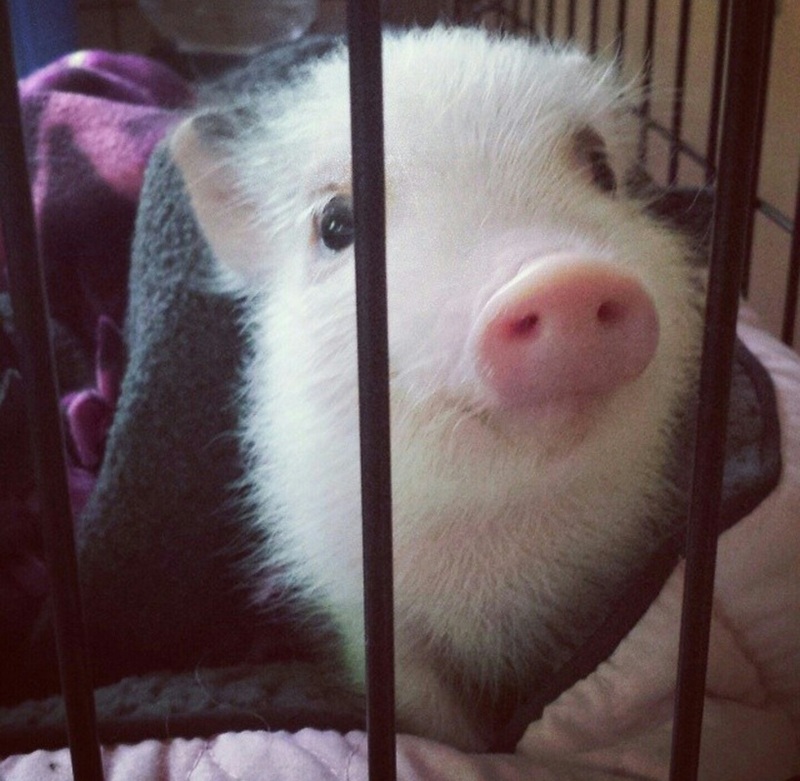 Through my research into other breeders, I found that many keep their breeding pigs outdoors since unfixed pigs tend to make poor pets. Fleetwood Farm keeps all of their breeding pigs inside in extremely clean and spacious conditions. One look at Karrie’s set up and you are certain that Fleetwood Farm does not view the breeding pigs as merely investments, but as true pets. All of the breeding pigs loved to be handled, were extremely friendly, and (what should be assumed with pet pigs but is unfortunately not true with other breeders) all litterbox trained. 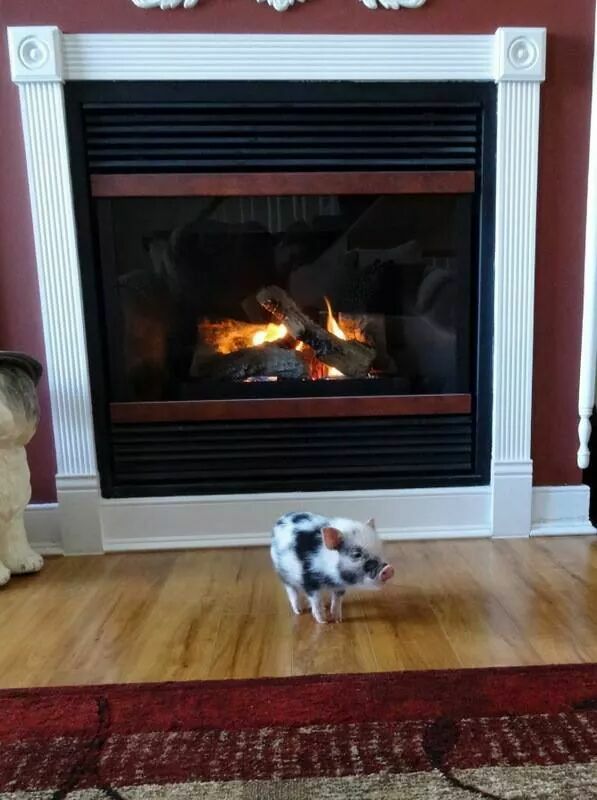 Karrie’s fulltime pet pig, Kwynn, was the only assurance I needed to know that pigs truly possess exceptional intelligence. Kwynn was able to perform tricks that I would never dream a pet could do (such as playing the xylophone). The love that Fleetwood Farm has for their pigs is exemplified in the fact that they have, in conjunction with a vet and a bionutritionist, developed their own food blend designed specifically for mini pigs. Unlike some of the other brands, it clearly states what it contains, is only comprised of high quality materials, and seems to be much better for the pigs (for instance, it does not immediately swell in their stomachs and evenly digests over time). 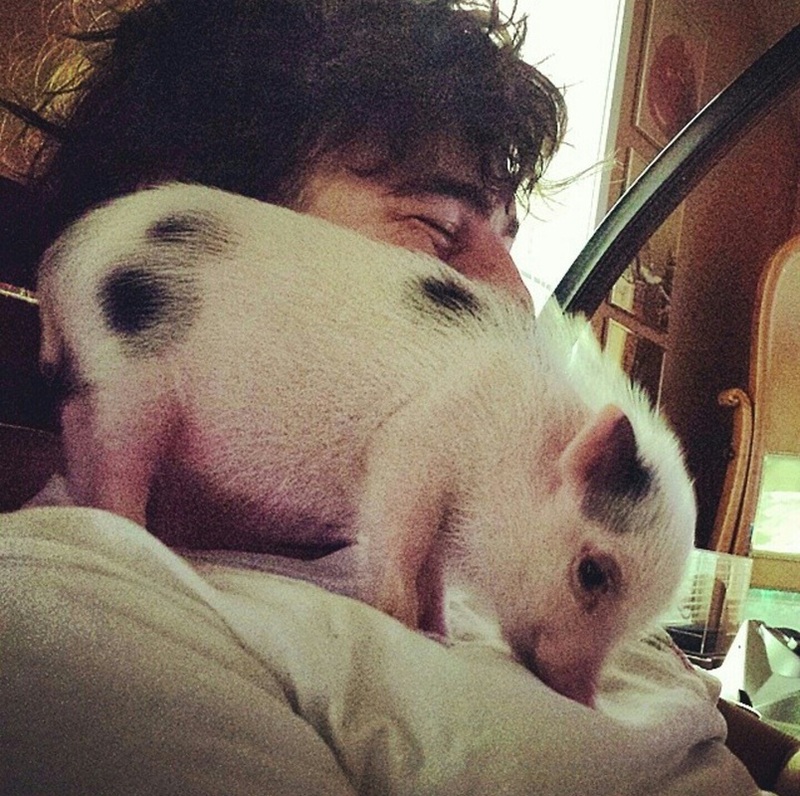 Clearly, I decided to obtain my piggy from Fleetwood Farm. While I have not had my pig for very long, Karrie has been great about answering any questions I may have and help with training. At 6 weeks old (when I first met him) my little Juliana pig loved to be held, have his stomach rubbed, and was potty trained. Since then, he has made exponential progress. 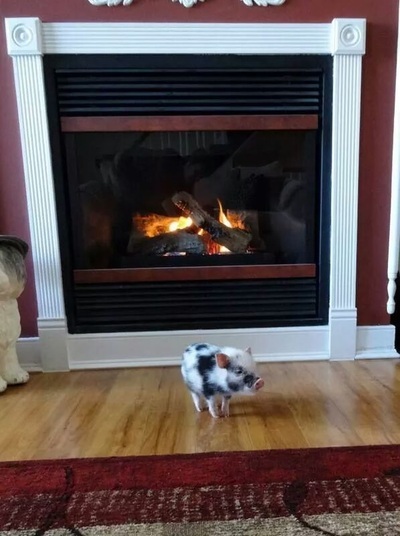 I would caution anyone who is interested in getting a mini pig that they must do their research, know what kind of commitment they are getting into, and understand that some breeders will deceive you into buying a farm hog and calling it a mini pig. With that said, I can safely say that I would recommend to anyone, strangers or my own family (I have done both in fact), that if you want to get a mini pig (which everyone should consider) Fleetwood Farm is the most legitimate, humane, honest, and kind breeder I have found in my extensive research. 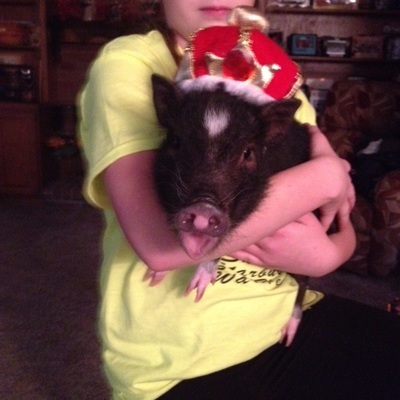 Fleetwood Farm does not raise pigs to be sold; rather, they raise true mini pigs that are ready to be your best friend. 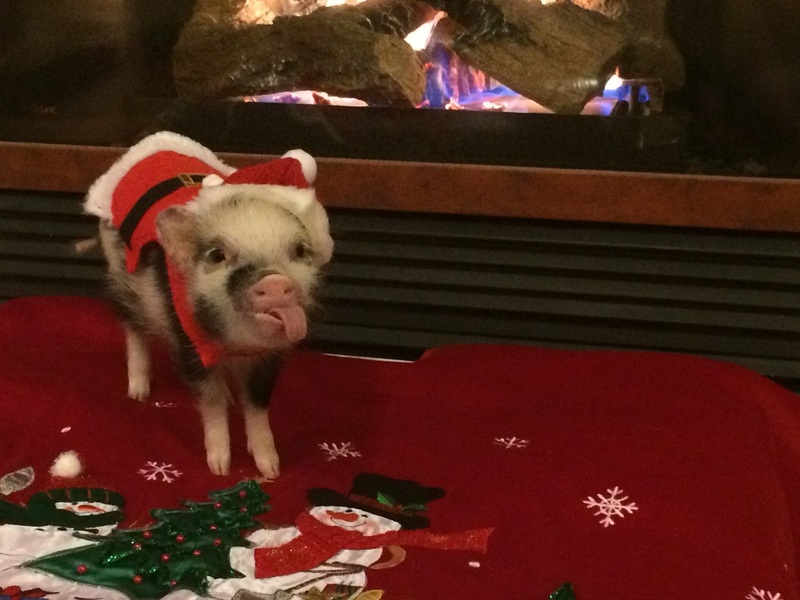 I have wanted a pet pig since I was a little girl, but my parents were hesitant to allow it. I had mentioned to my boyfriend (now husband) when we started dating that this was a dream of mine. When we got engaged and started planning our future, the idea came up again and we decided we would look into it after our wedding. In the meantime, I started doing some heavy research knowing I wanted to understand what I was getting myself into if this was to become a reality! I had talked to quite a few breeders, but none of them were as open, honest and responsive as Karrie. She answered all of my questions (and believe me- I asked a lot of questions!) I felt comfortable with her and I have to say, she was the first breeder I could say that about. Honesty is what I was looking for, and honesty is what I got with Karrie. I could also tell that Karrie cared about what happened to her pigs and what type of home they would be going to. She prepared us very well with all sorts of documentation as well as a wonderful blog that helped us understand what we were getting into! We picked up our Wellington on October 4th. My husband and I were both very nervous. Karrie gave us a tour of her farm and we got to meet all the pigs! We spent some time playing with Wellington and giving him some treats (Cheerios) so he could learn to quickly like us! Next thing I knew, he was cuddled up in my arms and we were in the car on our drive home! We can both honestly say this was the best decision we've made yet! We absolutely adore our Wellington. He has a very calm and loving personality. 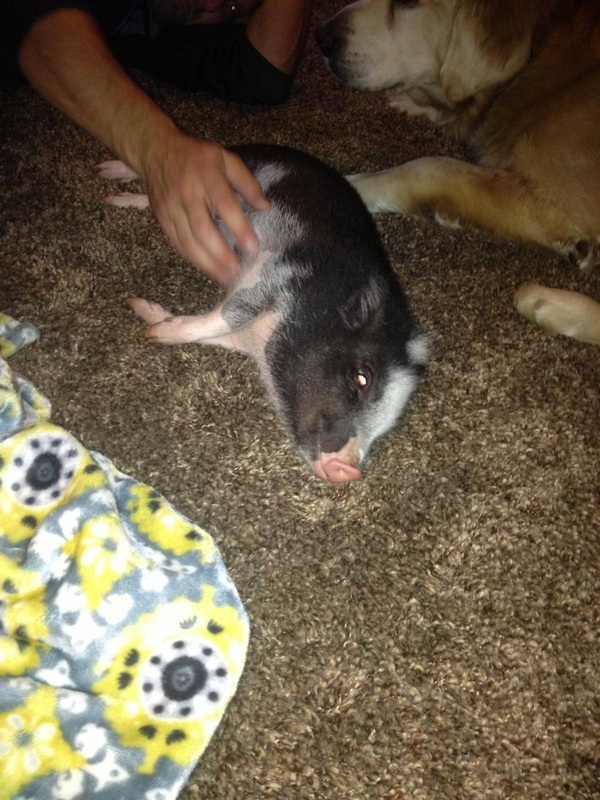 We were able to pick him up and handle him from day 1, and this is definitely a result of how much Karrie and her family loves and cares for these pigs. She made sure that she was handling Wellington from a young age, which made it much less scary for him when we did it! We describe him to people as "a combination of a cat and a dog". He has all the conveniences of a cat and the wonderful, loving personality of a dog. Every night at 8:00 on the dot is snuggle time. Wellington comes looking for one of us to snuggle up with us while we watch some TV. 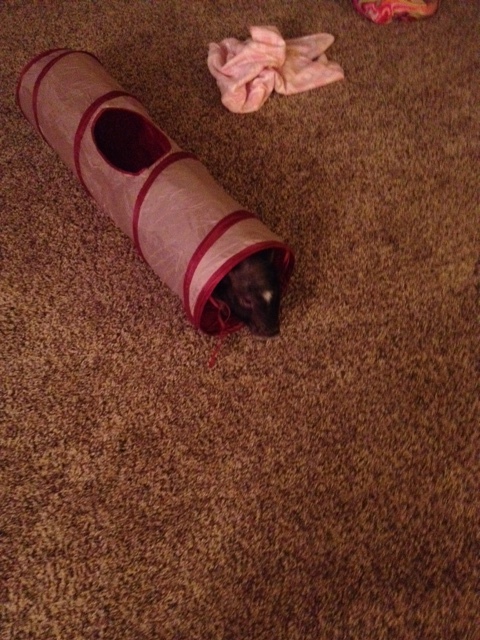 He also has his bursts of craziness where we refer to him as "rocket pig". He runs around the house super fast playing with us! Like I mentioned earlier, we absolutely love our Wellington! I know that his wonderful personality has everything to do with how Karrie and her family raised him from birth. 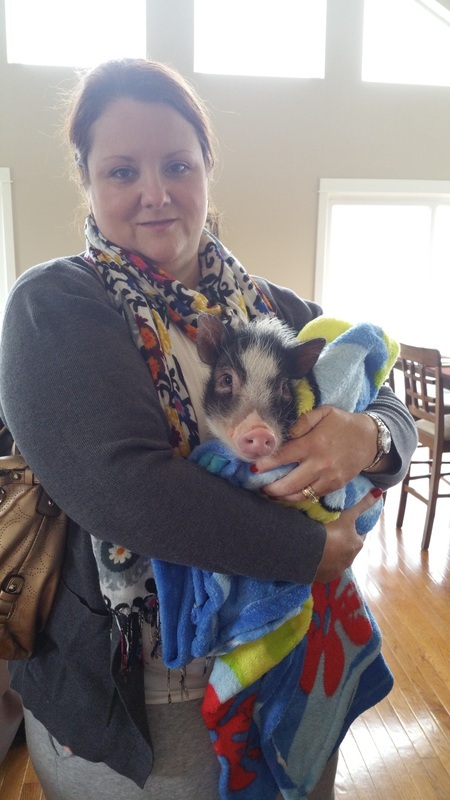 We highly recommend going with Fleetwood Farm if you are looking for a healthy, loving pet pig!